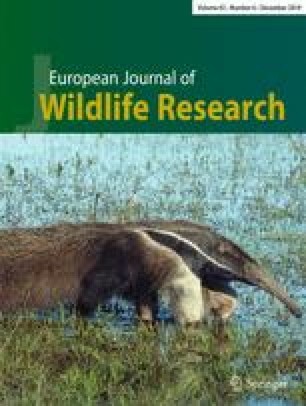 To substantiate the pathways of radiocaesium contamination in wild boars in parts of Rhineland-Palatinate, we analysed radiocaesium-activityconcentration of 2,433 wild boars shot in an area covering 45,400 ha in the western part of the Palatinate Forest between January 2001 and February 2003. Also, for a fraction of 689 animals shot between May 2002 and February 2003, we collected their stomachs for the examination of content and Cs-activity concentration. Wild boar meat contamination followed a seasonal curve with maximum proportions exceeding accepted levels in the summer (21–26%) and minimum levels in winter (1–9.3%) indicating a higher consumption of a contaminating source during the vegetation period. The autumn decline is obviously attributed to the extensive consumption of low-contaminated beech nuts. An exact analysis of food composition in 18 stomachs with maximum Cs-activity concentrations [345–1,749 Bq/kg (fresh matter: fm)] and 18 with low Cs-activity concentrations (≤20–199 Bq/kg) was carried out in the summer of 2002. Deer truffles (Elaphomyces granulatus) were found in significantly higher proportions in stomachs with maximum contamination levels than in stomachs with lowcontamination levels. This fungus was found in the Palatinate Forest, by a trained dog, in average densities of 1 truffel/20 m2 primarily in spruce stands, showing an average Cs-concentration of 6,030 Bq/kg (fm). On the basis of our findings we stress the hypothesis that deer truffles function as a main Cs-source for the wild boar in Rhineland-Palatinate. We would like to express our thanks to all participants. Particularly to the staff members of the forest districts of our study area as well as the local hunters who contributed their time and efforts in supporting of this study. Without their dedicated help this study would not have been possible. Furthermore, the Institut fuer Lebensmittelchemie, Speyer and Trier, the Landesamt für Umwelt, Wasserwirtschaft und Gewerbeaufsicht, Mainz, provided us with data and assistance in the monitoring program. K. Ahrendt, P. Balcar, U. Fielitz, S. Fink and her dog Barney, W. Giese, J. Haedeke, R. Hentzschel, N. Hahn, P. Hoppe, O. Keuling, A. Klett, P. Müller, G. Pröhl, A. Roeder, G. Ruhnke, K. H. Schwind, G. Schüler, M. Steiner, and H. Ziss deserve special mention. Finally, we are grateful to U. Fielitz and J. Block whose comments and constructive criticism helped to improve this paper. All experiments comply with the current German laws.